Wow, just wow, John. And super congratulations! You deserve 'em. Couldn't happen to a more deserving author. Again, my congrats and best of luck at the Edgars! I hope to see you in NYC. Super congrats, John, and I'll be a minx here and say I'm damned glad you're not Canadian, because I don't need you as competition for the Arthur Ellis Awards! You rock. Leigh, David, and Fran -- Thank you for such kind words. David, I do look forward to seeing you in NY--I believe Liz Zelvin and Dale Andrews will be there too, and I hope other SleuthSayers as well. Many thanks, Melodie! If I recall, you've already won the Arthur Ellis Award--quite an accomplishment! As for the Edgar, I am but a nominee, and when you consider my competition in that category this time you'll see why my plans are merely to show up and clap for the winner. But I am most certainly fortunate just to be in the running. Way to go, John! And continued good luck. Thank you, Paul. I truly do think luck plays a large part in this kind of thing. So much depends on happening to catch the right editor with the right story on the right day, so sometimes it becomes a roll of the dice. 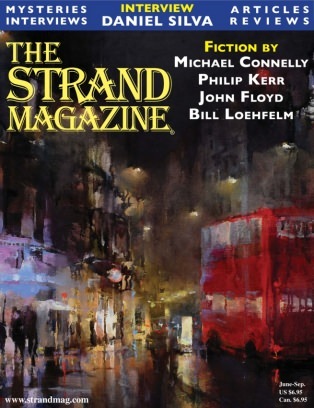 I do hope my good fortune lately might convince others to continue to try the Strand--they are indeed good folks, there. John, congrats. You're on a roll. Best go buy that Powerball ticket. Add my congratulations, all honors well deserved and overdue. Many thanks, R.T. You're right, I should do some betting in case Lady Luck is still in a good mood. Thanks to you also, Herschel! I often long for the days when there were a lot of markets out there for mystery short stories: AHMM, EQMM, Murderous Intent, Mike Shayne, Crimestalker Casebook, Futures, Orchard Press Mysteries, Amazon Shorts, Raconteur, Detective Mystery Stories, Dogwood Tales, Enigma, Whispering Willows, Genre Sampler, Mystery Time, Heist, Reader's Break, Red Herring Mystery Magazine, etc. Now there are only AH, EQ, Strand, and maybe half a dozen more. Congratulations John! I've also been enjoying the Sheriff Jones & Angela Potts stories in Woman's World. Be sure to buy a lottery ticket or three today, there is a new moon in Aries. I know that's what I'll be doing. Wow! Great news and congrats!! Thanks, Liz--those little WW mysteries are fun to write. Dale, I appreciate the kind wishes! Looking forward to seeing both you and Liz in a little more than a week now! Order up some good (warm) weather up there. Well deserved, john. I just read and enjoyed Driver today. Thanks, Rob. That story was fun to write, mostly because politicians are easy to dislike. As I recall, the Strand has been good to both of us over the past couple of years. Heartfelt congratulations, John. and good luck with the Edgars. And I want to add my personal thanks for the many times you have bent an ear to listen to this struggling would-be, and the many things you've taught me. Thanks, Larry. That goes both ways--you've taught me many things as well. It's great to have you on board, here. Congratulations, John. Good luck with the Edgar. Hope the coming year is just as good to you. Weather up here is getting better, should be in the 60s next week. Thank you, Pat. Best to you as well, in all your writing adventures. I hope we'll stay warm here now, until at least October. Maybe November . . .
Congratulations, John! You make us all proud, as though your hometown friends have a thing to do with your outstanding success! I'm prayin' and pullin' for you to win the Edgar, my friend! Many thanks, Kaye--it's great to hear from you. Fond memories, of good ole Kosciusko High School!